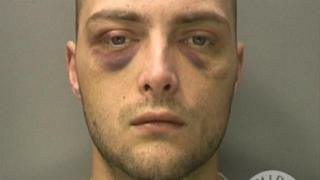 A man has been jailed for life for murdering his cousin in a drunken rage. Glen Elvin got into a disagreement with Christopher Harm after drinking in a pub in Brierley Hill, West Midlands, in October last year. CCTV captured Mr Harm, 28, running away but Elvin caught up with him in a car park and stabbed him with "ferocious force", police said. Elvin, 26, denied murder but was convicted and sentenced to serve a minimum of 20 years in prison. Wolverhampton Crown Court was told Elvin was among three men arrested for murder at the scene, in Engine Lane, in the early hours of 13 October. The trio had been travelling around England in a van putting up posters advertising a circus, police said. Image caption Christopher Harm was described as a "loving son, dad and brother"
Two were later released without charge before Elvin, of no fixed address, was charged. Mr Harm, from County Durham, died from a single stab wound. His family said they had been "left in pieces forever" from the loss of their "loving son, dad and brother". Det Ch Insp Edward Foster, said it was a "hugely tragic waste of a life". "Knife crime ruins lives and devastates families," he said. "We worked tirelessly to piece together the events that led to Mr Harm's death and I hope today's sentence can give his family some comfort, knowing the man responsible has been jailed."